Introducing the next generation in retail ATMs. The Mini-Bank 1700W raises the bar for engineering, quality, and design. 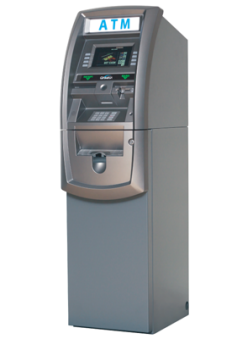 Built with the philosophies of reliability, durability, and security you�ve come to expect, the Mini-Bank 1700W offers the absolute best value in its class. While targeted for lower volume markets, the small footprint design retains all of the standard features of a higher end machine. The 1700W integrates a host of features including a 7� High-Resolution Color LCD supporting multiple custom screen advertisements. Communication options include 56K Modem or integrated Ethernet (SSL).